She has been drawing pictures and making cards for her teachers. 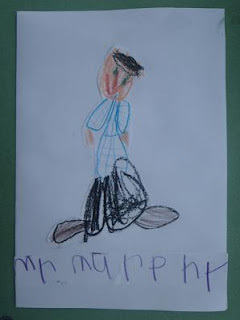 Benny has also drawn a picture of Mr Murphy (isn't it cool, it's his first person drawing). In her quiet time, when the boys are in bed, Rebe and I have been working on a Mr Murphy doll that she wanted to make for him as a gift. I have also gotten mugs printed with the picture she drew of him (and another of the teaching assistant) as a thank you gift. ...swinging, oh lots of swinging. Bubs and Man gave Joa this great swing for his Birthday (you can see how much he loves it). ...finding odd Tiger bird chicks, who have gotten lost and have no mother or father or owner and who have built a nest in the tire swing. ...Rebe's been collecting bugs and marking them off in her book, and when they are not in her book she's adding them to the back herself. ...and we have been eating bubas. Most normal people call them frozen smoothies, or cool pops or such like. The kids have always enjoyed these, but have found holding them too cold. All my napkins and tea towels were used as protection for their little hands to stop them from getting too cold. I came across this great idea, and we decided to make our own buba holders. Benny picked his fabric (an old felted wool sweater) and we sewed on a button (to make it glamorous) and then machined the sides. It works brilliantly and Benny is oh so proud of his sewing. Now we welcome the break from school and I hope we will also get some much longed for spells of warm sunshine. Aw, enjoy the holidays, we have a few more weeks here yet. Lovely class photo, we should get ours soon. Loving the pictures, great to see things from the childs eye and hand. Wow, to see it all in pictures really amplifies how fast time moves and how fast wee ones learn new skills. Great job mom. Love the chip cutter idea, will be buying a couple for my two! And loving buba holders too ... like you I've been through everything to protect their hands from the cold, will be making a couple of these too :) or I might embelish a sock each to fulfil the same purpose. That owl cake is amazing!Happy summer break! We are also hoping for some sun here too. Dear Laura, I love this post! Ezri has been loving swinging too, though his swing is not as cool as Joa's!